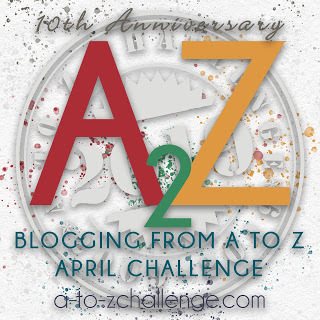 Blogging everyday beginning on April First with a topic themed on something with the letterA, then on April second another topic with the letter B as the theme, and so on until I finish on April thirtieth with the theme based on the letter Z. The theme of the day is the letter scheduled for that day. She pressed her palms down onto the cool granite counter. Her arms were bent, her bony elbows poked out on either side, and her shoulders were hunched forward. She stood there motionless, head bent, her dark hair falling down in waves, hiding her face. She slowly inhaled and held her breath. She did not want to ever breath again. But, like the current circumstances of her life, she obviously was not the one in control and the air from her lungs whooshed out into the quiet of the hushed, empty space. After all of the buzzing and hissing of the last few months it was as though the constant din had been shoo shooed out, leaving behind, instead, the sounds of silence. She needed this moment of stillness to gather up the shards of her splintered self. She was a petite slender woman. At first glance she may have appeared to be a fragile type. She was deliberate in the way she managed her stature. She held her head high above her shoulders and her back straight. She pushed her chin out in front, almost in a challenging way. When she looked at you with her mesmerizing blue eyes, you could get trapped in her gaze, unable to look away. That’s when one quickly realized that there was nothing frail or delicate about her. But, it was different now. She felt small and brittle. She lifted her head and looked around the kitchen. She couldn’t remember the last time she had gone to bed without tidying up. Dishes from the night before were piled in the sink. She hadn’t even rinsed them off. She thought about the first time they met. The room was dark and smokey and so was he. The music was loud and pulsing. He was one of the band, the bass player, in fact. The attraction between them was instant. She knew it was irresponsible and quite frankly a little reckless to jump into a relationship that quickly. She had always lived her life that way, though and she had had no regrets. He had managed to keep his illness a secret from her for a long while. As she reflected back on it now, she couldn’t believe that she hadn’t noticed the signs sooner. She wondered if knowing sooner would have made that much of a difference anyway. Probably nothing could have changed the inevitable outcome. She was weary. Weary and sad. He had taken so much of her away with him. She knew she would never again be as carefree. She could not imagine that she would trust another with her heart. Her sister Kathy tried to assure her that she would not always feel that way. Big John, her older brother, held her in his arms and told her everything would be okay. “Remember, I am only a few minutes away,” he said. Her vibrating cell jolted her out of her reverie. She read the text message. Her hands began to shake. She dropped the phone. She slid down to the floor and sat huddled in the corner, hugging her knees tightly to her chest. “He’s out there watching me,” she cried. Oh this is good; at first I thought he might have died, but now I'm not too sure (or maybe its late here and I'm reading more into it than there is?) It seems perhaps in this case she has lost her sense of freedom? That she will never be safe because he's still lurking around? Thank you. I’m happy that you like it. I'm hooked! I want to know what happens next. 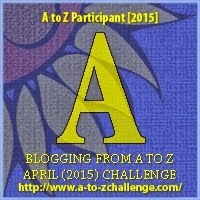 I'm doing A to Z also, but don't have a theme. I don't have A written yet. Reading blogs is my avoidance strategy. Maybe I could write A is for avoidance! I hope your A is done by now. Looking forward to reading it. Oooh, that has always been one of the scariest scenarios I can imagine. I hope Matt could do something to help! That’s why I can’t watch that TV show “Stalker”. It is a scary thought!